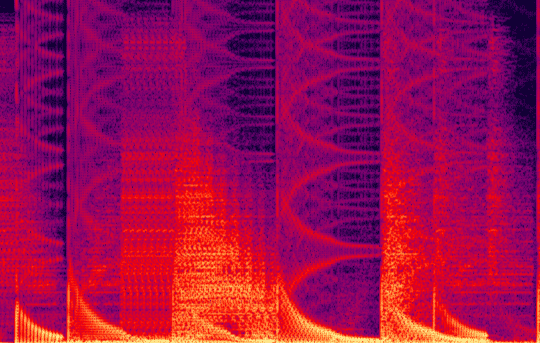 As psilodump once noticed, audio spectrograms can look pretty neat. And it’s worth noting that the more effects of different kinds you throw, the more interesting the spectrum gets, usually. Every little retrig, pitch pitch bend or filter sweep makes the spectrum look cooler. What I especially like about the image above is the pattern that looks like stalagmites/stalactites if rotated 90 degrees. 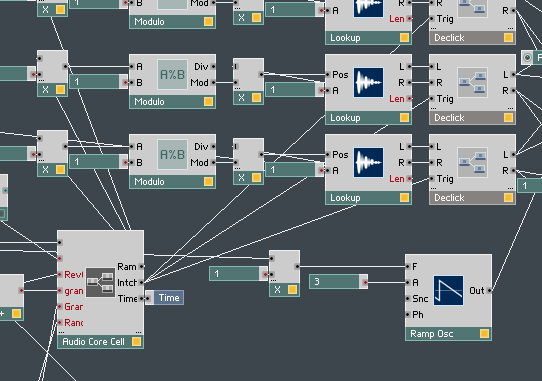 I’m testing out a beat masher that I’m building in Reaktor. Everything you hear is algorithmically and/or randomly composed, although the parameters could of course be controlled via the keyboard. 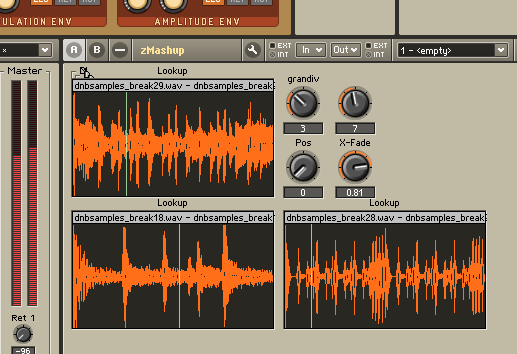 The actual masher can do rearrangement, instant repeat, reverse and high pass. For extra complexity, the masher is controlling three breaks simultaneously, which it fades between with different positions for the left and right channel. Now I just need to make the auto-masher vary the sound more over time. Draft of of a Reaktor automatron that I’m working on. Warning, contains no chip sounds whatsoever! Electroacoustic music recorded at Studio 4, EMS Stockholm using the Serge and Buchla modular synthesizers and the spring reverbs. 8:26 of strange noises. The sample consists of three parts. 1) Chords consisting of a base note and 4 consecutive fifths. The chord moves 1 semitone per step. 2) Arpeggio moving a semitone per step. Left channel plays a sawtooth wave, right channel plays a square wave. Everything generated with Reaktor. This is a compilation of 145 BPM mixed together by Nonfinite. It features 12 tracks from 12 chip artists from 8bc, and my track Just A Squirt is in there. I know this announcement comes a little late, and so. And as you might’ve noticed, the 30 day challenge went to hell. I couldn’t keep up the pace, so I simply quit early. Sorry. This page was previously hosted on http://gameboygenius.8bitcollective.com/wordpress/category/my-music/ (*).